Herasymenko (Herasymenko-Volkovinsky), Polykarp [Полікарп Герасименко (Герасименко-Волковинський)] – metallurgist, specialist in physical chemistry; born on 23 July 1900 in Odesa (Ukraine; at that time – Russian Empire); died on 6 April 1958 in New York, USA; buried in St Andrew’s Ukrainian Cemetery in South Bound Brook, New Jersey. Polykarp Herasymenko graduated from a gymnasium secondary school in Odesa in 1919, and in October of that year he enrolled in the natural sciences department of the Faculty of Mathematics and Physics at the Kamianets-Podilskyi Ukrainian State University. As a student he took part in the resistance to the establishment of Bolshevik rule after the failure of the struggle for Ukrainian independence, and, to avoid arrest, in the autumn of 1921 he illegally crossed, via Galicia, into Czechoslovakia. He studied in the Faculty of Natural Sciences at the Charles University in Prague where, in the autumn of 1925, he gained a doctorate in natural sciences on completing a dissertation on polarography. In the same year he became a lecturer in the Department of Mathematics and Natural Sciences of the Ukrainian Higher Pedagogical Institute in Prague. In 1927 he defended his habilitation dissertation entitled “On the electroreduction of uranyl salts” and became a reader (docent) at the Institute, where he continued to teach until its closure in 1933. In June 1928 he became a full member of the Lviv-based Shevchenko Scientific Society. In 1928, having obtained a grant from the Rockefeller Foundation, Herasymenko came to the United Kingdom and, in 1928-29, conducted research in physical chemistry at King’s College, University of London. During this period he published four papers in the Transactions of the Faraday Society, and he also became a member of the London-based Faraday Society, devoted to the study of physical chemistry. Returning to Czechoslovakia, from 1930 almost to the end of the Second World War he worked at the steelworks of the Škoda industrial conglomerate in Plzeň (the largest steelworks in Czechoslovakia) and headed the departments of metallurgy and physical chemistry at its research laboratory. At the same time he taught at the Ukrainian Free University (UFU) in Prague, where he was a docent (1930-40) and assistant professor (from 1941) in the natural science department, and lectured on physical chemistry and chemical thermodynamics. He was a member of the Society of Ukrainian Engineers in Czechoslovakia. In late 1938 he became a full member of the Ukrainian Research Institute in America (European branch), which was active in 1938-39. 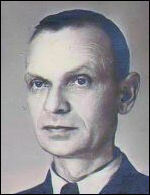 During the war he was active in the affairs of the local Ukrainian community, as a member of the branch of the Ukrainian National Alliance (UNA) in the Protectorate of Bohemia and Moravia, a co-founder and joint head of the Prague branch of the UNA’s Ukrainian Students’ Aid Commission, and, in 1942-1943 (until its closure by the Gestapo), head of the UNA’s publishing house (Kulturno-naukove vydavnytstvo). He was also editor-in-chief of the Tekhnichno-hospodarskyi visnyk bulletin published by the UNA engineers’ section. In consequence of his activities, in early 1944 he was arrested by the German police and was held for almost a year in the Pankrác Prison in Prague. At the end of the Second World War, in May 1945, he was imprisoned by pro-Communist elements for three months in Plzeň. After his release, in August 1945 he moved to Germany where he lived in a displaced persons camp. He resumed his teaching at the UFU (re-located to Munich after the war) as an assistant professor in the Faculty of Philosophy (1945-46), and in 1947 was elected a full professor. In addition, he was a co-founder of a natural science faculty of the UFU in Augsburg, comprising departments of chemistry and biology, аnd of an autonomous faculty of mathematics and geodesy in Regensburg. He was a leading member of the Organisation of Ukrainian Nationalists (Melnykivtsi), but subsequently withdrew from political activity. For some time he was head of the Society of Ukrainian Political Prisoners which was active from January 1946 in Germany and Austria. In 1948 Herasymenko received an offer of employment from United Steel Companies Limited of Sheffield, one of the largest steel manufacturers in the UK, and came to Britain for a second time. From 1948 to 1951 he worked as a leading researcher in the company’s metallurgy laboratory. On behalf of the company’s research department, in January 1951, he completed an English translation of an article entitled “A Contribution to the Metallurgy of the Blast-Furnace” by the German researchers T. Kootz and W. Oelsen, and the translation was subsequently published in the US government journal Technical Translations. He was a member (from 1938) of the Iron and Steel Institute, and during this period he published two papers in the Journal of the Iron and Steel Institute (1947, 1950). As a result of the second of these papers, on his ionic theory of slag-metal equilibria in steel-making, he gained international recognition in the field of metallurgy. In the summer of 1948 he was a member of a preparatory committee for the formation of the Relief Board for Ukrainian Students in Great Britain (KoDUS). In January 1951 he was elected chairman of the newly-created Society of Ukrainian Engineers in Great Britain. At the end of April 1951 he left for the USA. From 1952 he worked as a researcher (subsequently – research professor) in the Department of Metallurgical Engineering at New York University, managing research projects on behalf of leading US industrial clients and giving lectures to students. He was a member of the American Institute of Mining, Metallurgical, and Petroleum Engineers, the American Society for Metals and the Electrochemical Society. Herasymenko’s main academic interests included physical chemistry, electrochemistry, polarography and metallurgy. He was the author of a monograph on theoretical physics (Prague, 1925-26), two patents relating to the production of steel and titatium, and over 40 articles in Ukrainian, Czech and English. After his death his book on Ionic theory and the electrochemical interaction between slag and metal in steel-making (Iionna teoriia ta elektrokhimichna vzaiemodiia shlaku i metalu pry vyrobnytstvi stali) was published in the Ukrainian SSR (Kyiv, 1966). He was also the author of articles of general interest in the Ukrainian periodicals Orlyk (1946) and Ukrainski Visti (1947), two booklets on the origin of life on Earth (Regensburg, 1947, 1948) and a booklet about the works of the historian Oleksander Ohloblyn (Munich, 1948).